It’s getting warmer….Do you get confused about what season it is when you step outside? Winter, Summer, Spring??? The plants are waking up and unfurling leaves as they feel the heat. Let’s just hope old man winter goes easy on them this year. I’m expecting at least one more snowstorm. We ALL want Spring and Summer ASAP. How to get there from here? My husband had a great idea. Flower shows!!! I’ve identified some in the northeast up and coming. The most impressive appears to be in. A visit to any one of these warm, floral venues will chase away a lot of winter blues. Try it! The Connecticut show is going on right now. I think the show focus is a little less floral and more about support for home and garden improvements. It’s called the CT Flower & Garden Show– Feb. 23- 26th, in Hartford, CT. It showcases product from Agriculture & Forestry, Hand, Machine & Garden Tools industries. Philadelphia Garden Show– the LARGEST indoor flower show, hosted by Pennsylvania Horticultural Society – March 11- 17. Looks awesome. There’s more. Celebrate flowers all around the state. Cherry blossoms at the Brooklyn Botanical Gardens. 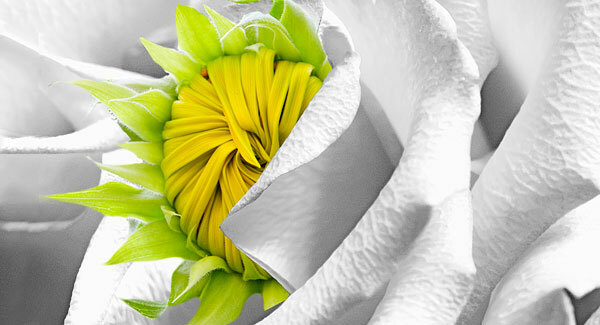 Boston Flower Show– March 22-26 at the Seaport World Trade Center, Boston. Themed as Superheroes of the Garden. (?) ; Cool lectures and demos; I liked the idea of growing and using edible flowers. And if you don’t want to travel or aren’t a big flower fan…The other thing people often do in winter is improve the inside of the house, right? It can also offer real personal benefit. Do you get daily caught up daily in racing to some finish line? Handwork, of almost any kind is an excellent antidote to rushing around. It can offer real balance. Personally, I relax when I cook, sew, and work in the garden or..wood. Left to right: Sanding, patching, staining and varnishing three times over leads to dirty trim (gimp). Removing old gimp, re-stapling the fabric edge and hot gluing all new trim down takes time, but is well worth it. Woodwork demands that you take time, think, plan invest in something whose goal is totally within your control. You can do a minute- just look and think about it, or invest some or lots of time in bringing its process forward. If you can submit to a reasonable process, without a crazy deadline, the results are tangible, often pleasing, even lasting. And, you can take pleasure long afterwards in just gazing at the work of your hands. Beautiful wood brings out the nurturer in me. 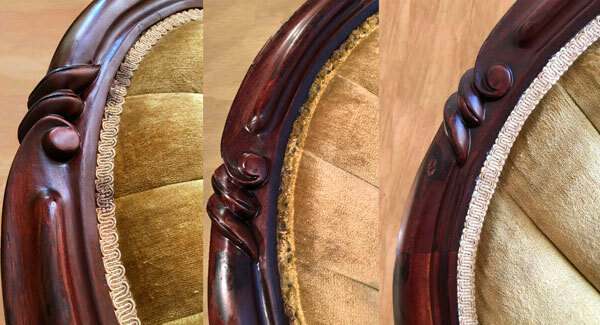 What started as a quick “putty fill” ended up many hours later with a significant make-over. I drew the line at the upholstery-maybe another year. 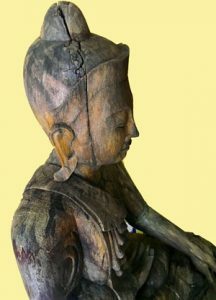 In the meantime, the Serenity garden statue is still waiting patiently for my hand at improving its very weathered wood. Lots of work needed. Thank goodness he’s patient. Serenity has some tremendous cracks and dryness. Cant wait to bathe him in oil! In the meantime, the Serenity garden statue is still waiting patiently for my hand at improving its very weathered wood. It required online study, conversations with knowledgeable friends and the local hardware. Anybody can do it, if you find enjoyment in it. Lots of work needed. Thank goodness he’s patient. And then, there’s music! Jackson Browne and Friends. What’s not to love about good harmony and musicians playing together? 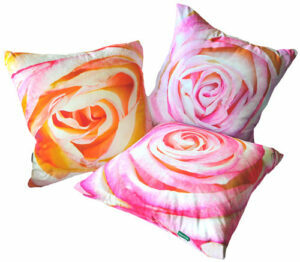 Paola Prints pillows are designed and lovingly made to bring comfort to your living space.